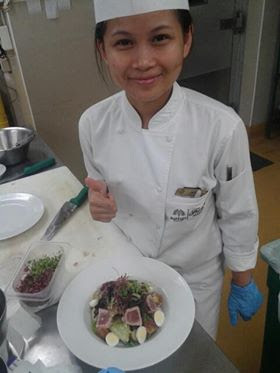 Anihan Technical School graduate, Jean Carla Andal, is working as Commis Chef 1 at Royal Caribbean Cruise Line based in Miami, Florida, United States. After graduating from Anihan, Jean Carla was first employed as kitchen helper in Timberland Sports and Nature Club in San Mateo, Rizal. From there she worked in Mandarin Oriental Hotel Manila, in Startek Makati, and in Raffles and Fairmont Hotel Makati. "I am very grateful for landing these jobs with my education at Anihan Technical School because I was able to help my older brothers whenever they needed money including help pay for the operation of one of my brothers. I am also able to give my parents enough money to start a small convenience store in 2011 which is still going strong up to now"
"Anihan has taught me many things that I need to live in the kind of environment we live in now. They taught me to pray, to offer my work for God’s glory, and to not sacrifice my long term goal just for a short-lived happiness. I learned to be smart when making decisions- that I cannot let negative circumstances affect me. I learned to be strong against temptations and to always choose to do what is right over temporary pleasure"